What does a Sacramento Veterinarian and Indiana Jones have in common? Oh, sorry. 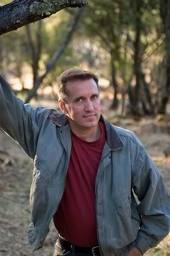 You’ll know him better by his pseudonym, James Rollins; the SIGMA Force Series and New York Times bestselling author. Chicago born James grew up with comic book hero Doc Savage. Years later, a fan pointed out the similarities between his childhood hero and his writing. James had not even realised. Graduating from the University of Missouri in 1985, James moved to Sacramento, California and established his own veterinary practice. A thousand miles from the successful author he is now, James’ love for science would prove to be the foundation for many future novels. In 1999, James sold his first novel under the name James Clemens when he entered a writing contest at the Maui Writers’ Conference. He caught the eye of Publisher and Judge, Terry Brooks and Wit’ch Fire was the first of five books in the The Banned and the Banished series. A year later, James released Subterranean; his first stand alone book under the name ‘Rollins’. Never far away from his love of Doc Savage, in 2007 James was asked to adapt Steven Spielberg’s Indiana Jones and the Kingdom of the Crystal Skull into a novel. And, as an added bonus, he was given the go ahead to add several new scenes – thrilling Indie lovers worldwide. Writing two novels a year, including the Jake Ransom children’s series, leaves little room for time off. Add to that the book tours, interviews, seminars and talks taking him across America, Europe and Australia, its hard to see how James finds time to relax. Then again, his idea of relaxation comes in the guise of spelunking, scuba diving, and hiking. And, to top that, James’ skill and generosity at mentoring have made him a firm favorite with aspiring writers. A regular guest speaker for workshops and conventions, James is also among the core faculty of the annual Hawaii Writers Conference and Retreat. Jake Ransom and the Howling Sphinx, debuted May 3, 2011 and The Devil Colony, was released June 21, 2011. As unbelievable as it sounds, James found the time to answer these ten questions. Just as well it was a quick interview. Yea! James Rollins rocks! I seriously can’t even begin to describe what a great guy he is. Thanks so much for bringing us this interview. I love your 30 Second format. Likewise, Donna. 🙂 Daisy, the Love Pooch is already getting her questions together and practicing her Cockney accent. Well done James! I mean Donna, I mean James! Oh, you know who you are! Love these 30 second interviews. I can see you’re a girl with connections! Love James! I’m so with him on the Archaeologist profession choice. Now if only we could find a way to do archaeology while skydiving. Have to work on that. James Rollins’ life makes me tired just reading about it! He’s everywhere. What a cool guy. I love this 30 second thing. It’s so fun! Anyone whose favorite curse word is ‘frak’ has my lifelong loyalty. Another ‘Frak’ lover. Is this word like the Brits using the ‘F’ word? I asked Nigel what word he would use – What would be yours? Frak comes from the TV series ‘Firefly’. It’s a fun replacement for the ‘F’ word. When I’m sort of mad, I say ‘what the frikkity frak’ and when I’m super mad, well my favorite curse word is the real ‘F’ word. Sometimes, you just can’t substitute the impact that word has. I use it sparingly or it loses impact. I’ve never watched Firefly, but I love Nathan Fillion in ‘Castle’. It is the same guy, right? Hi Donna. Good interview. Sounds like James has a packed life. I’m looking forward to hearing him at the DFW conference. I read Subterranean when I used to travel a lot and only connected it with him recently (I’m slow at these things). I love it, it has a believable non-humans and his spelunking knowledge obviously helped with the realism of crawling around small spaces. And what do you know? Frak is up for a second time! Nigel, I love the word ‘Frak’. Out of curiosity, what word would you put in there? Funnily enough the word Frack is used extensively around Fort Worth. kids, use it, teachers use it, its on billboards, its everywhere. No, we’re not a foul mouthed bunch of red necks …. well … anyway, my point was that “Fracking” is the method used all over the metroplex for breaking up rocks when drilling for gas. So the question “are you coming to the fracking conference” isn’t a derogatory reference to the writers do! Oh come on, Nigel. I love your confidence in me but I have no idea what ‘Rats’ means, lol. Great interview, Donna! I adore James. Thanks to Kristen, I met him on Twitter and I blush every time I receive a tweet from him. He is an amazingly kind and supporting writer. Heck, I like to call him my friend, and I can’t wait to meet him at DFWcon this coming May. And there’s that word “frak” again. Am I watching the SyFy channel? I wish I could train myself to say this word instead of the other…. Tiffany, I can’t wait for DFW Con. We are all going to have a blast! And, I too need to replace the F-word….I love ‘Frak’, it has a great ring to it. Nice interview Donna. I am not much of a fiction reader but on Piper’s “recommendation” I read a couple of Mr. Rollins books and I enjoyed them. I mumble my well practiced noncommittal male response. I give her my normal blank look and say “Thank You”. Visit 2 day 2) As I greet her at my dinning room table “Did you enjoy those books last night? I ask her if she would like some eggs. It occurs to me that Mr Rollins hired the wrong publicist. If Guantanamo prisoners had any cash Piper would be down there force feeding them Rollins books after giving the Marines some cookies. The prisoners don’t read in English? Too bad, it’s time to learn if you want your gruel today. The most useful thing I can say is that I have learned some things from reading Mr Rollins’ books. Thanks for a cool interview Donna and Mr Rollins. ….And what a brilliant way to sum up Piper. “ If Guantanamo prisoners had any cash Piper would be down there force feeding them Rollins books after giving the Marines some cookies. I absolutely adore Piper. Thank you so much for finding, and taking, the time to give this interview a read, and for doing what you do. You guys totally ROCK! I’d never heard “frack” before! How cool to have James Rollins for an interview, Donna! (I think we’re all with James on the “phlegm” thing).